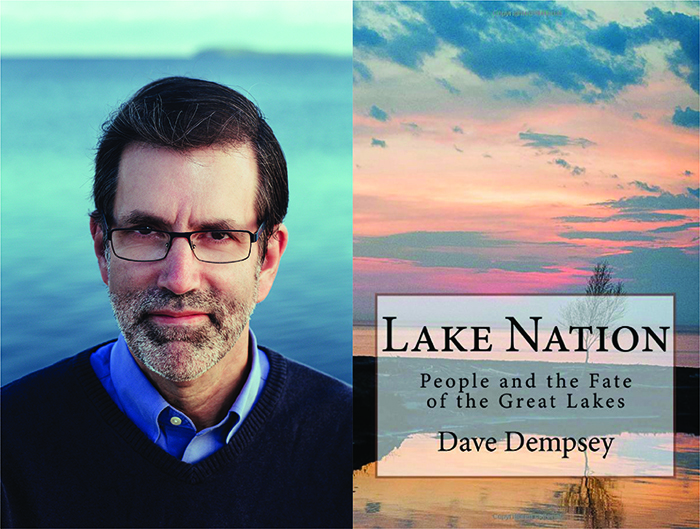 Author Dave Dempsey’s latest book steps back from policy and homes in on the hearts of Great Lakes residents to talk about their connection to the lakes. Dempsey has a career neck-deep in Great Lakes policy and publication. He was the environmental advisor to former Michigan Governor James Blanchard, a former policy director with the Michigan Environmental Council and policy advisor with the International Joint Commission. And he has published 10 books, including five about the Great Lakes. The latest, “Lake Nation: People and the Fate of the Great Lakes,” is different from his other books because it’s not so much about political actions but why residents think the lake is in trouble. “It’s the human dimension as opposed to the science dimension or the policy dimension,” Dempsey said. He wanted to explore the gap between residents’ love of the Great Lakes and what they are willing to do to protect them. In his interviews with Great Lakes residents both familiar and unfamiliar, he kept vocabulary at a generalist level, he said. “The whole point of the book is to look at an inner circle of people who are really knowledgeable about the Great Lakes and talk more from a general public perspective,” he said. Dempsey thinks books about policy can come across as more political. “So maybe policy books tend to frame the issue in a wrong way, that it’s all about politicians passing laws when politicians don’t pass laws unless there’s people forcing them to do it and that begins with these passions and connections people have to the lakes,” he said. There are two major threats facing the Great Lakes today, he said. “One of the threats is either ignorance or lack of motivation. Not enough people are familiar with the lakes or have enough information about them,” he said. The other threat is how climate change in the long run will wreak many changes on the biology of the Great Lakes, he said. “It sort of overarches all the threats facing the Great Lakes. If we don’t deal with climate change, perhaps a hundred years from now the lakes will be unrecognizable,” he said. He translated into the book a hopeful and worried perspective from his interviews, he said. There is reason to be optimistic because people clearly care about the lakes, but Dempsey said he is worried that passion is not turning into actions to protect the lakes. “Lake Nation” is available for purchase on Amazon for $9.95 in paperback and as an e-version. Recently a bipartisan Coast Guard Authorization bill was passed and signed into law by President Trump on Dec 4th 2018. The new Authorization calls for the EPA to be involved in creating ballast water standards for the Coast Guard to enforce. Special attention will be paid to the Great Lakes. John Hopkins has released findings of virus in the human throat associated with green algae. They report “viral hoping”. (virus hosted in green algae spreading to humans). Search -virus in your throat John Hopkins, or hopefully the link below works. This is very significant to ballast water in the Great Lakes and St. Lawrence river. Ballast water moves algae. Ships exclusively confined to the Great Lakes need to treat the water. As of now little to no coverage of new ballast water regulations being developed has been provided to the public by environmental groups or by internet reporting. Needless to say, broadcast media continues to never mention ballast water. Sad as now more than ever “environmentalist” or those who care about human health should be involved. Well, here is a problem as I see it. I wrote Ice Boom Theory after years if research. People in positions to do something about it weren’t interested in solving problems. Fishermen, boaters and beach goers did not care or help me. The Power Authority, which creates these huge problems by stopping the natural ice flow could not care less and answers to no one. What will it take to overcome inertia and get people involved? After 12 years of trying I grow tired. Google “Joe Barrett ice boom” for the truth. Hello Joseph. You’re right. You got censored. Your comment called someone lazy and apathetic and made fun of the depth of their research. Approval requires civility. You are among the most frequent commenters on Great Lakes Echo – no ring-kissing involved in any of those. So I see we are being censored if we don’t kiss the ring. Where is my comment? I will look for this and pass along to all. Our family has a large Lake Erie frontage property. My parents respect/actions for the environment carried forth mostly from an age of less use. Now rented out by a sibling who is just as you describe. He/They claim concern and steps, but the privileged culture,regardless of wealth, of using to excess is so embedded, my requests of alterations are met with blank awareness. Yes the government, agriculture,and manufacturing must act. But the consumers are driving the above as well as direct damage. Water use is abused and wasted by individuals at the greatest rate. Also, from the multitude of environmental organizations that I receive notifications and actions, individual conservation is rarely the target.